This most interesting surname, with variant spellings Tewer, and Tewers is of early medieval English occupational origin, describing a "tawyer", i.e., someone who prepares white leather, which is cured with alum rather that tanned with bark, from the Middle English "tewe", to taw. Job descriptive surname originally denoted the actual occupation of the bearer and later became hereditary. 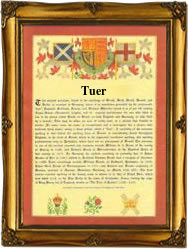 The surname itself first appears in the late 13th Century (see below), while one John Tewer appeared in the Subsidy Rolls of Yorkshire in 1327. The London Church Registers record the following early recordings of the surname: Alice Tuer, who married William Wright at St. Giles', Cripplegate, on March 23rd 1643; Deborah, daughter of William and Deborah Tuer, who was christened at St. Martin in the Fields, Westminster; while one Caroline, daughter of John and Caroline Tuer, was christened at St. Mary Aldermary, on January 4th 1795. Andrew White Tuer (1838 - 1900) founded a publishing business called "Leadenhall Press" in 1877, and was editor of "Paper and Printing Trades Journal". He was also noted for his collection of art of all kinds. The first recorded spelling of the family name is shown to be that of Nicholas le Teward, which was dated 1275, in the "Subsidy Rolls of Worcestershire", during the reign of King Edward 1, known as "The Hammer of the Scots", 1272 - 1307. Surnames became necessary when governments introduced personal taxation. In England this was known as Poll Tax. Throughout the centuries, surnames in every country have continued to "develop" often leading to astonishing variants of the original spelling.